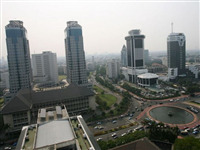 Indonesia recorded a trade deficit of 8.57 billion USD in 2018, the highest-ever level, according the country’s Central Statistics Agency (BPS). In 2017, the Southeast Asian country ran a trade surplus of 11.84 billion USD, the BPS said on January 15. Indonesia’s export turnover went up from 168.82 billion USD in 2017 to 180.06 billion USD in 2018. However, the import turnover also increased from 156.99 billion USD to 188.63 billion USD. Head of the BPS Kecuk Suhariyanto said the cause of the deficit in 2018 was mostly due to the oil and gas deficit of 12.4 billion USD. Meanwhile, other fields saw a surplus of 3.84 billion USD, he unveiled. The Indonesian Government has been applying measures to restrain imports such as imposing higher import duties on more than 1,000 items, adopting regulations on the compulsory use of biodiesel so as to reduce oil imports, and delaying some infrastructure construction projects./.